With his 6-3, 6-2, 7-6(4) fourth round win over the 70th ranked Maximilian Marterer at the French Open 2018 in Paris on Monday, the World No. 1 Rafael Nadal overtook Jimmy Connors to become the all-time third in the Grand Slam match wins list. This was the Spaniard’s 234th victory at a Major tournament against just 34 losses, while the former top-ranked player had finished his career with a record of 233-49. Ahead of Nadal are his two rivals, Roger Federer and Novak Djokovic. The Swiss leads the pack with a stunning record of 332-52 and the Serb is at 244-40. Eight-time Grand Slam champion Andre Agassi occupies the fifth spot in this list, having achieved 224 wins against 53 defeats. This was not the only major accomplishment of the day for the 10-time French Open champion. Nadal also became the fifth man in the Open Era to grab 900 career wins. The southpaw now only trails Connors (1,256), Federer (1,149), Ivan Lendl (1,068) and Guillermo Vilas (948). Marterer proved to be a tougher customer than what anyone imagined, especially in the third set. Being a lefty, he matched Nadal shot for shot, despite having dropped the first couple of sets. He was successful in keeping the top seed away with his crosscourt forehands and even put pressure on Rafa by going a break up at 3-1. But the complexion of the match changed soon as he failed to build on his advantage. A poor service game handed back chances to the World No. 1 on a platter, who grabbed them and levelled the score. In the ensuing tie-break, Nadal had the upper hand at 3-2, which he consolidated after his German opponent kept misfiring his forehands. 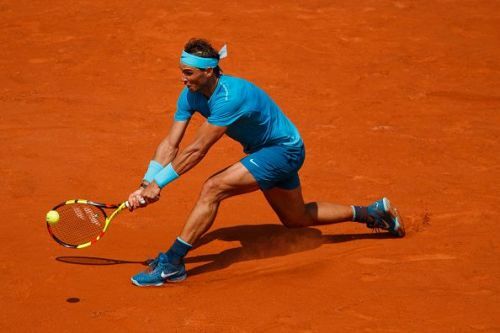 When a backhand sailed long from Marterer on match point, Rafa earned a quarter-final berth at Roland Garros for the 12th time. Standing in between the King of Clay and a spot in the semi-finals of his most successful Slam is the 11th seeded Diego Schwartzman. The Argentinian launched an improbable comeback from 1-6, 2-6, 4-5 down to oust the sixth seeded Kevin Anderson. Do you think Nadal can continue his dominance at Roland Garros and win an unprecedented 11th title? Have your say in the comments.